so since its officially christmas time- as of tomorrow, i will now begin to write posts relating to my FAV holiday. if i can beat this cold, my husband and i will begin to decorate tomorrow. it's total chaos when this starts- mainly b/c of the outside lights. we always try to come up with some awesome way to do them and then they end up being incredibly tacky and shorting out our power b/c we have too many lights connected together. two years ago, we actually caught the bushes on fire...who knew it wasn't good to leave the lights on in the rain? i almost peed myself when i saw the sparks....luckily,it ended very quickly. i absolutely love using an element like this industrial sink from kohler to think outside of the box for a jack and jill bathroom. while it maybe a little pricier than your standard sink, the impact that it gives off will be worth it. plus, you save by not having to outfit a vanity in the bathroom. 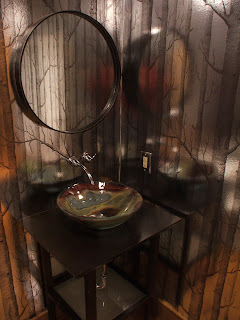 i love what designer jackie terrell did to the underside of the basin...painting it avocado green! how much fun is that? 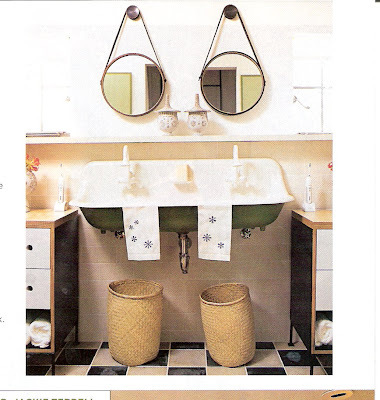 if you are interested in this look but think that it's too expensive to achieve, check out local salvage stores...you might stumble across an old one which would make it just that much more fabulous! as i flip through magazines the color that is really standing out to me is gray. i see it used in a ton of design elements right now. i use to feel like this color was cold and i couldn't imagine using it on the walls but i have a new outlook on gray. it seems so peaceful and pairs beautifully with blues, browns, corals, etc. i will say, i tend to lean to the brownish/ gray version of the color...i think that the added brown pigment gives off a warmth that makes the color not seem as well, how do you say it- gray! i was thrilled when a client/ indecisive friend of mine wanted to use the color. we looked at a ton of paint for her walls. 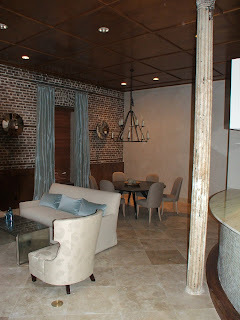 we wanted the house to feel neutral but not look like a "spec home" where the walls seem like an institution. i can't wait to see how it reads on the walls. another great thing about the color gray is that it looks absolutely beautiful with marble... marble on the counter top, on the bathroom floors, or as tile in a shower. i've looked at a lot of wood flooring lately and the darker shades tend to have purplish gray undertones in it- they are gorgeous. this color also looks great with another trend right now, metallic. so if you are in the market for a change in paint or a new color exploration, try gray....you'll be in for a pleasant surprise! so every time i get a new Cottage Living, i get another inspiration. last month, it was fran's letters (which i need to show y'all) and this month it's kitty's dining room. i love the diamond wall treatment....however, i think it's over my head. the homeowner, kitty, did this by hand, three times until she finally got this result- which i think is stunning. i would go absolutely crazy trying to perfect this look. for pete's sake, i went crazy trying to paint 6 letters...can you imagine the stress i would be under! plus, it's all about the straight lines, good painter's tape, and math. i love the white and chocolate...my dining room would look more like a tiffany's box b/c it's robin's egg blue and i can visualize the diamonds in white....my husband would kill me...i can see me now, on a ladder attempting to get a straight line...yep, this project isn't going to happen. but way to go kitty! 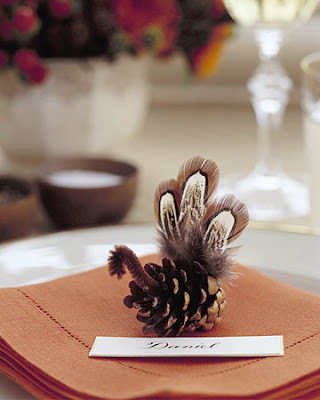 who wants to waste their time reading a blog when it's thanksgiving holidays?? i hope everyone has a wonderful time eating lots, drinking lots, and spending lots of quality time w/ your family!! i can't wait for everyone to get here! see y'all next week! loveage! after my daughter had her meltdown last night, i needed some time for ME....what do you do when you need time to veg? my husband thinks i have turned into an internet nerd...i love searching it for ideas, reading other people's blogs, celebrity gossip, etc. but after 2 hours of crying (just b/c she could) i wanted to relax. my poor husband took the brunt of the crying...which i hate b/c he only has 2 hours with her when he gets home from work and when she is crying bloody murder, it doesn't make it pleasant. especially after working all day in a place which in my mind is identical to the office. so you ask what i was doing while my sweet hubbie tried to calm our daughter....i cleaned our bathroom. i think that this is quite possibly the worst job anyone can have and to have your background music be a very unhappy baby, only makes the job that much more painful. now, i NEVER voluntarily offer to clean the bathroom...but i knew that i wanted to soak in a bath after our screaming kid was down and so i had to "do it for the family". my husband and i hate cleaning the bathroom so much that when we got married, we hired someone to help us clean it. unfortunately, when i decided to start my own company, that was the first thing that had to go. Oh my gosh, KELLY WEARSTLER did an interview for PW!! i am soooooooo excited that my number one design hero agreed to do an interview with little ol' me!! kelly wearstler is the mecca in the design industry...in fact, i think she could be the 8th world wonder!! thanks so much kelly for taking time out to do this interview! this truly made my year! 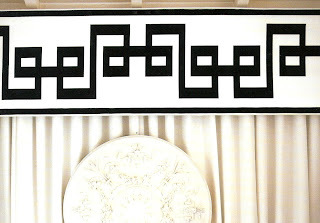 Q: What inspired your draperies at the Estrella, the crisp white panels with the exaggerated Greek key motif? You must have an amazing seamstress! A: The Greek key is such an iconic form, so I went for a neo-classical meets post-modern-in-the-desert aesthetic. I chose to keep color way black and white because it feels so crisp, airy and refreshing – perfect for Palm Beach. 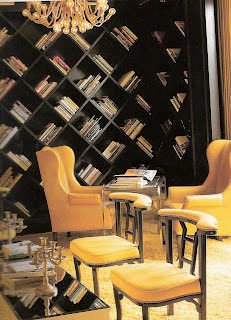 Q: I love the bookshelves in the Viceroy study, how did you come up with the concept of doing the shelves on a diagonal? A: My goal was to present the books in an unexpected way. When we were actually fabricating the prototypes, they were laid on their side and looked more interesting than just straight on, so that’s how the design came to be. Q: What do you think is the most overdone trend in design right now? A: Looking as if you bought all of your furniture in one place is so overdone. I know people find this to be an easy way to decorate, but choosing pieces you love from a range of sources creates a richer, more textured look. Q: Describe your ideal client…. A: My ideal client is someone who has a program and a vision, but trusts the designer to run with it - that’s why they hire a designer in the first place. I like a client who has something to say and something to give because they’re the one living in the space. Q: What do you miss most about South Carolina? if you want to know what makes my heart melt, its b. braithwaite. 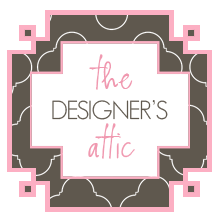 i fell in love with this baby boutique when it was featured in southern accents last year. i loved it so much that i drove to atlanta just to go there and buy my baby's crib. the store is gorgeous and why shouldn't it be...it's creator is nancy braithwaite who has been an interior designer for 35 yrs before starting the store. she and her daughter chaffee, decided to open a baby boutique after going on a shopping trip to paris(i would kill to go on a shopping trip in paris). the layout of the store is amazing....very classic and sophisticated. a lot of baby stores can be junked up with whimsical aspects, but not here. the "nurseries" are set up in a monochromatic look, beautifully showcasing each of the contemporary cribs they offer. one of the best parts about the whole experience are the beautiful topiaries that you are greeted by at the entrance of the boutique....a huge teddy bear and rabbit. it is truly a pregnant woman's shopping dream....if you are ever in atlanta and are craving some baby bliss, stop by b. braithwaite! so i have had my desk chair for 3 yrs now and it still remains how i bought it- with ugly white (well dingy white) damask fabric on it and around the arms the fabric is actually unattached from where i had my upholster look at it so the horsehair is exposed. i am not a damask kind of girl...well maybe funky damask but definitely not traditional. i love my chair...the lines on it are amazing...i call it a lady's chair b/c it hugs your body when you sit in it. it is an antique that i purchased at a flea market with all intentions of reupholstering it and placing it in my LR. however, once i started my own design company it became my desk chair (no staples roller chair would do). i have always known that it would be recovered and look fabulous one day. it has just had to sit here b/c upholstery is expensive, especially in c'town b/c everyone seems to jack up their prices. Q: How does it feel to be called “a breakout designer” by Domino, a publication that I feel like has totally dominated the design world for the 20/30 yr olds? A: Honestly, I can't imagine the thrill wearing off. It was a big goal, and to have achieved it feels amazing. Q: So many people think that being an interior designer is so glamorous! I often find that funny when I think of all of the non-glamorous things that go along with the job…can you describe your typical day? 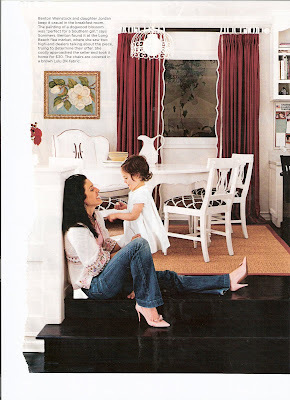 A: I usually make coffee for my husband and myself, and start the day catching up with my huge stack of magazines. 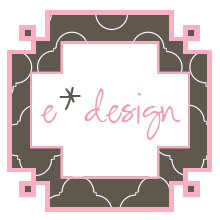 By 9:00 I am on the computer checking emails and returning calls, and lately I have gotten to spend a lot of time designing, playing fabrics, and sourcing furniture, which has been great. On a bad day I spend a lot of time following-up with contractors and delivery-people, double, triple, and quadruple checking things. My least favorite days are when I have to be an enforcer. My most favorite are when I can have lunch with Valerie and Tyler in my office, and the phone rings the right amount. Q: What is one trend you wish would go away?? A: Coral - but only so I can start using it again in a few years. Q: When looking at your bedroom, it looks so well put together! I had no idea that was an Urban Outfitter headboard until I read the side notes…often people our age cannot afford the services of interior designers; do you have favorite “budget friendly” tips for people who would like the look of a designer inspired room? 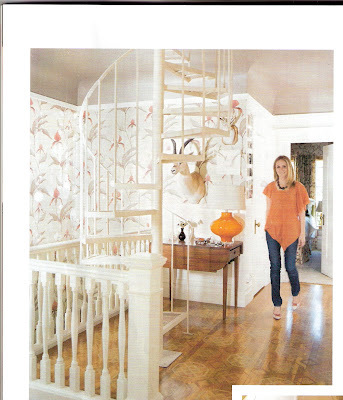 Q: Lastly Chloe, what would you say was the one aspect of design you could not live without? A: My books! I am a junkie at the bookstore, and use them for everything; for inspiration, guidance, decoration, and to make me look smarter than I am. while there are so many things that make me happy, the andrew reflector is up at the top. i was lucky enough to use them in the downtown house i featured two days ago. they looked amazing against the old charleston brick. 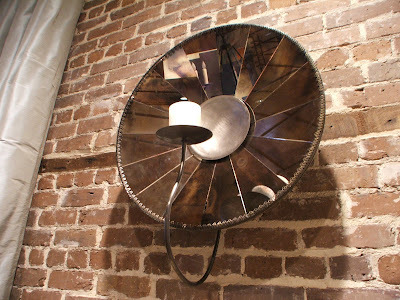 urban electric is a to-the-trade lighting company that started here in charleston. the showroom use to be located on historic King Street and i loved going in there and being captivated by the creative window displays and beautifully designed lighting. i just received their new catalog and as i was flipping through it, i saw that Tom Scheerer was one of the lighting designers....as you can see to your right, he is one of my new design heroes. chloe warner told me about him on monday when we were exchanging emails. if you haven't taken a look at urban electric, i think its time. the lights speak for themselves... they are gorgeous, current, and classic in their appearances. here are some others to drool over if you have a second: gunston, hightower, paraply, the quarter, and sheridan...as always, beauty does not come without a stiff price tag but these are really worth it. first i will touch on the obvious- the room is wonderful. 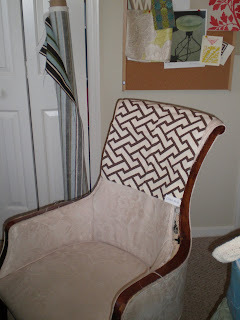 great use of the popular lulu dk "chant" fabric on the DR chairs. 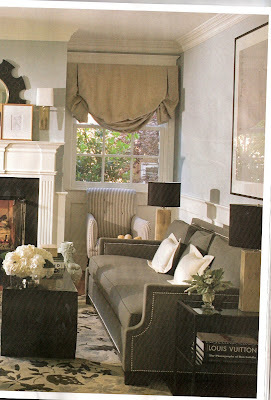 and as y'all should know, monogramming makes it better, so i love the wing chair with the table! the floors are a beautiful ebony and i love the detailing down the leading edge of the draperies. so maybe my life isn't too far from this picture...minus the fact that she has showered and her kid has hair....happy tuesday! the main area was all one room w/ tall ceilings and i love the exposed old charleston brick wall w/ the earthquake beams running through it. we renovated the kitchen (you can see part of it on the right of the pic); it was really a dark room with black cabinets and stainless steel counter tops. we repainted the cabinets, added the frosted glass, replaced counter tops w/ granite, added the mosaic tile around the bar surround, and did all new appliances (the refrigerator was just divine, a sub zero with the glass front). the floors were brick (not old, but were new brick) and my client felt like it was always dirty so we replaced it with travertine. 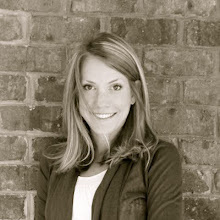 my client was a young, business woman who had amazing style so deciding on the furniture was a fun task. she was always very polished and so it was nice to see that the furniture reflected her image. 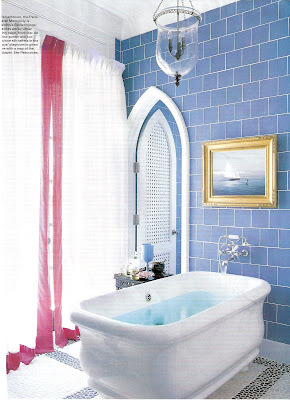 she wasn't afraid to be adventurous so the powder room was wonderful. 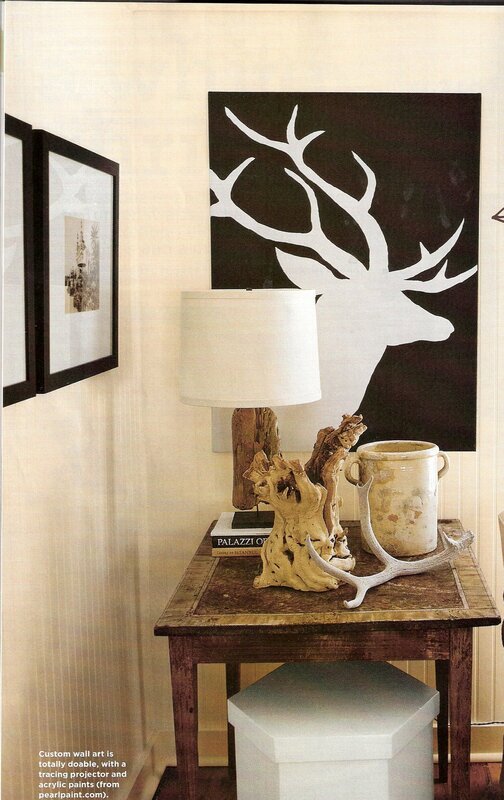 we used the metallic cole and son's woods wallpaper in the small space. it was a great project that i was super sad to see end. so i have been telling you about this diy project that i am working on and here is the inspiration. 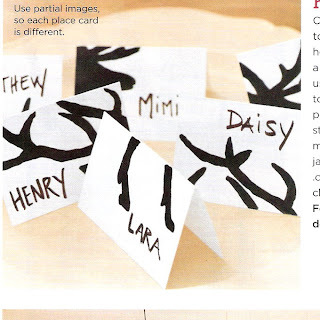 on tues i sat down to read my cottage living and fell in love w/ "fran's letters". thinking the project would be a piece of cake, i decided i would do my baby's name on this one tiny wall that has been white since the nursery was completed (i was waiting for something to inspire me). does this chair not turn heads? it was on the cover of the august Charleston magazine and ever time i see it, i love it. 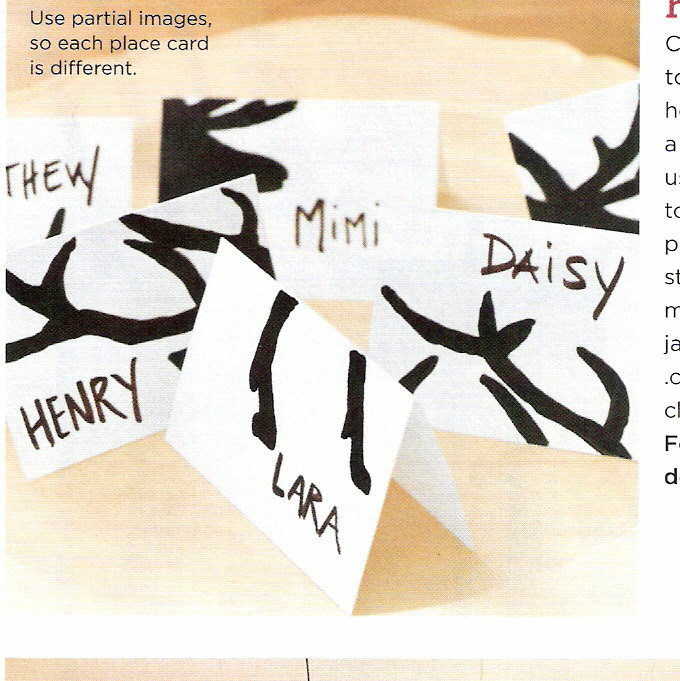 (i ran across it again when i was doing my magazine clean up a couple of days ago!) 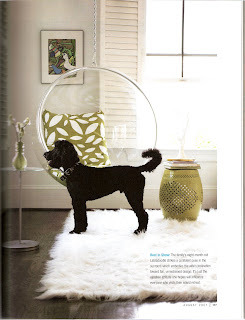 i have this obsession with acrylic and lucite and the bubble chair just makes my heart putter (so does the price tag). originating in 1968 by designer Eero Aarnio, this chair is still just as amazing nearly 40 years later! *the color is off in the cushion and garden stool; its actually this great chartreuse green that really pops not that mucky green it scanned in as.